The body of one of Iraq’s top Shiite leaders arrived Friday morning in Baghdad amid tight security two days after his death of lung cancer. Abdul Aziz al-Hakim died Wednesday in Tehran, Iran, where he received medical treatment for more than two years. Top Iraqi officials and Western diplomats, including Britain’s ambassador to Iraq, Christopher Prentice, gathered at Baghdad International Airport as security forces sealed off streets in the capital. President Jalal Talabani and Prime Minister Nuri al-Maliki also were present. 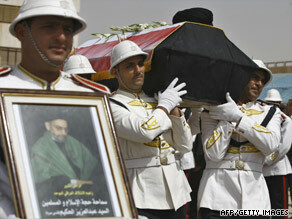 Al-Hakim’s coffin was taken off the plane as men in black suits walked in front, carrying his picture. Some in the crowd sobbed. Watch how al-Hakim helped to shape Iraq » Funeral processions are expected later Friday in the capital and various southern provinces. Al-Hakim will be buried Saturday in his hometown of Najaf, according to al-Forat, the TV station of the Islamic Supreme Council of Iraq. Najaf is one of the holiest cities for Shiite Muslims. Al-Hakim ended his more than 20-year exile in Iran in 2003, returning to Iraq after U.S.-led forces toppled Saddam Hussein and his regime. “It was very emotional for me to meet with my people after Saddam fell,” he told CNN in 2006. “I was longing to see them. My goal in this life is to serve those great people, and I am very proud to be a part of them.” Iraqi Shiites were suppressed under Hussein’s regime, which favored the country’s minority Sunni Muslims. After his return, al-Hakim played a central role in shaping Iraq’s future. He urged Iraqis to shun bitter sectarian conflict after Hussein’s fall. Al-Hakim, who was born in 1950, was considered one of Iraq’s most powerful men. Though he never held a government position, his political bloc won the most seats in the Iraqi parliament in 2005. President Bush considered him an ally and called him when talks on the Iraqi Constitution stalled. He visited the United States three times during the Bush administration to discuss the situation in Iraq.